Maurie Quincey keeps Geoff Duke's Gilera at bay in the big 1955 meeting. 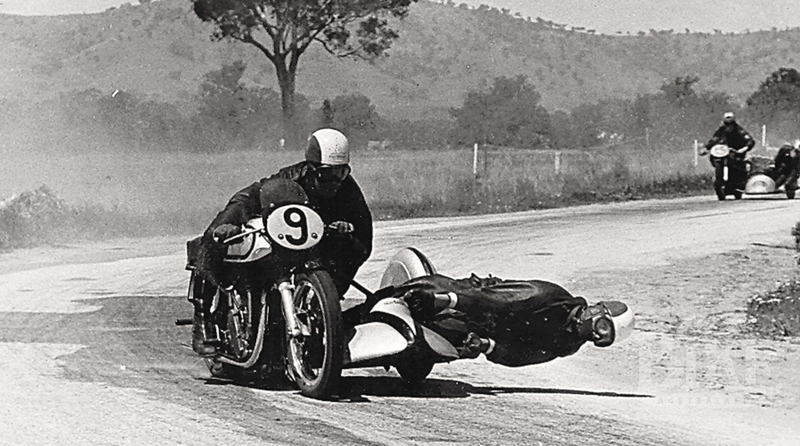 Back in 1954, excitement amongst the motorcycling fraternity was at fever pitch with the confirmation that the works Gilera duo of dashing English World Champion Geoff Duke and Irishman Reg Armstrong had agreed to an Australian tour over the summer months. Count Gilera had given his blessing to the venture, which was the brainchild of the indefatigable George Lynn, founder of the Victorian Motorcycle News paper, commonly known as the Green Horror. 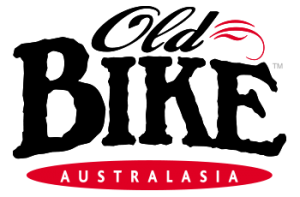 The tour would take in all states including Tasmania, but around this time, decent race tracks in Australia were few and far between. Worse still, racing on public roads was totally banned in South Australia and begrudgingly tolerated in Victoria. 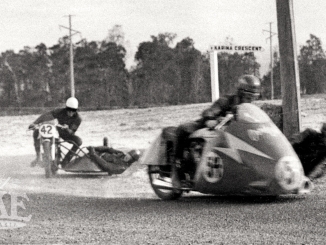 Indeed, the state regarded as the strongest motorcycling state in the Commonwealth had not one permanent circuit, although the new track at Phillip Island was taking shape slowly. The flat and featureless airfield at Fishermen’s Bend was identified as one of the two Victorian venues for the tour, but the second was a real dilemma. Darley, near Bacchus Marsh was little more than a winding footpath utilising a section of public road and totally unsuitable, Victoria Park in Ballarat not much better, and other former venues like Little River, Flinders Naval Base and Point Cook unavailable for various reasons. Military bases were attractive due to the infrastructure, but most were in remote locations. One however, had all the ingredients – Bandiana Army Camp at Wodonga. Bernie Mack and Ray Kelly take the corner at the end of the back straight at the opening meeting in 1953. Inside the gates to the complex lay an interesting network of roads, most well laid with a granite-chipped bitumen surface to cope with the heavy military machinery. By incorporating an adjacent paddock that was regularly used for tank training but which had a handy perimeter road with a hairpin corner, a circuit of almost exactly three miles was possible. On the southern side lay steep foothills but the camp itself was located on gently sloping land. The section which would comprise the back straight however had a crossroad in the middle with a pronounced hump – although this was not seen as a major issue. The ‘straight’ itself was almost three-quarters of a mile long and very fast. Being a working base, there were plenty of sheds, workshops, and buildings that could be used as canteens and offices, plus ample electricity and water. 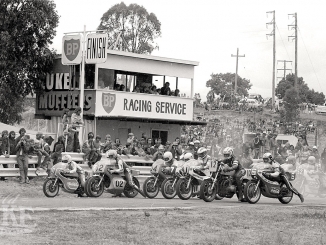 Bandiana had already hosted one motorcycle race meeting, on October 24-25, 1953. Organised by the North Eastern Centre of the Auto Cycle Union of Victoria, proceeds were donated to Wodonga Hospital. The meeting drew a reasonable entry, almost entirely from Victoria, but many failed to survive Saturday’s practice sessions, leaving race-day grids thin. 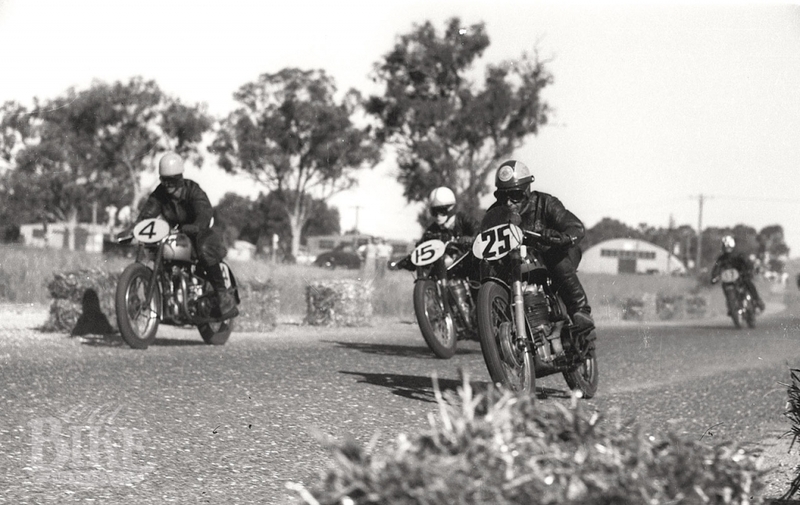 The very first event held was for 125cc machines, and the two Walsh Bantams, ridden by Maurie Quincey and Ken Rumble, ran away with the race from Eric Miller and Jack Walters’ MV Agusta. Don Cameron took his Velocette to victory in the 250cc event, while Quincey, on the ex-Kavanagh Manx Nortons, won the Junior and Senior, both times over Bruce Cameron. The expected fireworks in the Junior Sidecar fizzled when Bob Mitchell dropped out on the opening lap, leaving Bernie Mack to win from Jack Lodge and Keith Johnson in an all-Norton result. Frank Sinclair’s big Vincent had the legs in the Senior Sidecar race, although Mack and Mitchell brought their Nortons home ahead of George Murphy’s Vincent. Perhaps the race of the day was the Senior A Clubmen’s, where NSW star Ross Pentecost on his Shelsely Matchless finished first ahead of George Campbell’s similar machine, with Max Brumhead third on another Matchless. The Junior A Clubmen’s went to John Board from Trevor Pound. B Grade winners were Les Schultheis (Junior) and Jack Hunnan (Senior). Quincey set the fastest lap time of 2 minutes 19 seconds. In marked contrast to the fairly low-key opening event, Bandiana’s second meeting, on January 30th, 1955, was a huge affair, due, naturally, to the presence of the reigning World Champion, although Reg Armstrong failed to make the trip after being injured in Europe. Practice was marred by the death of 23-year-old Alan McBean, who crashed at the second corner, and injuries to Trevor Pound and Ken Hill. Although rain washed out the final practice sessions on Saturday, Sunday’s weather was perfect and a bumper crowd packed in, spilling into some prohibited areas and delaying the 10am start for half an hour. The meeting was officially opened by Colonel J.T.Simpson, O.B.E. Area Commander, Bandiana, who was soon to hand over his command, and expressed a desire that his successor should give the blessing for future meetings. As usual, the Ultra Lightweight opened the program, but most unusually, both Maurie Quincey and Ken Rumble were early retirements. This left Walters’ MV to do battle with Bob Brown’s BSA. In his efforts to throw Brown out of his slipstream, Walters incurred a fine for weaving, but the ploy paid off by just 0.2 seconds. A big field faced the starter for the Lightweight, with Harry Hinton Senior making one of his last appearances before retirement. 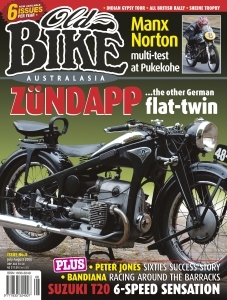 No one had an answer to the dynamic South Australian Les Diener however, who controlled the race on his self-built DOHC Velocette to win from Bob Brown and Jack Hogan from NSW, with Hinton fourth on his 250cc Norton special. Released from hospital after his practice spill, Pound dropped his 7R AJS again in the Junior Classic while well placed, but up front a fierce battle raged between Quincey and Keith Campbell. Eventually Quincey pulled well clear, while Harry Hinton Senior and Keith Conley pushed Bob Brown back to fifth. The 15-lap Senior Classic was the one everybody had come to see, and again the start was held up while officials struggled to clear the area of hundreds of people who had invaded the straight and the grid in the hope of getting a photo or even a glimpse of Duke and his fire engine red Gilera. From the push start the Gilera fired first and screeched away, but at the end of lap one, it was Quincey ahead after a standing start lap under the old record. Again the Gilera rocketed by on the long back straight, reaching 135 mph and leaping long and high over the ‘jump’ on the crossroads, but again, Quincey was quicker through the twists and turns around the camp buildings and led over the line. But Duke soon tired of the game, and with a lap at 2. 09 (80.9 mph) he went ahead again and stayed there. After being left on the line, local star Doug Fugger tore through the field to be placed in the top ten within four laps. A torrid battle for third place, between Owen Archibald and Harry Hinton Senior lasted until both fell in separate incidents, leaving Keith Campbell to deal with Barry Hodgkinson. Duke finished with nearly 40 seconds in hand over Quincey, who had a similar margin over Campbell. The big HRDs of Jack Ehret, Col Cheffins and George Slaughter, all from NSW, put on a good show in the 7-lap Sidecar Classic, with Bernie Mack, who had been left on the grid, riding the wheels off his Norton to latch onto the back of the group and failing by only half a second to displace Slaughter from third. A 6-lap Solo Handicap concluded the meeting, with Duke giving away 80- seconds to the limit man. Eric Hinton, off 45 seconds, put in a determined ride to lead Duke over the line by just 50 metres – the only occasion on his tour that Duke was defeated. Start of the Senior Clubman Heat One 1956. F. Lathlean (4), P. Donoghue (15), B. Edmonds (25). One year later, the crowds were back to see the illustrious English duo of World 350cc Champion Bill Lomas and Dickie Dale, with their works Moto Guzzis. The meeting also marked the return to racing by Maurie Quincey, who had been seriously injured at the Isle of Man the previous June. With Keith Campbell sidelined after his licence suspension following the shambolic Dutch TT, Quincey was the only local to offer any opposition to Lomas in the Senior Race. He finished second, ahead of Dale on the 350 Guzzi. As expected, Dale won as he pleased in the Junior, leading home Eric Hinton and Ken Rumble. Probably the best race of the day was the Sidecar Scratch, where Bernie Mack on his 500 Norton hounded Col Cheffin’s Vincent every inch of the way. Ken Rumble and Don Cameron on the Walsh bantams dominated the Ultra Lightweight over Roger Barker, on Jack Walters’ MV, and Rumble also took out the Junior Clubmen’s Final on his BSA. Other winners on the day were Jim Fisher (Ariel – Senior Clubmans), Bruce Hailey (Velo-Lightweight GP). Two six-lap handicap races rounded out the day, with John Shanks (Ariel) leading home Col Booth and Roger Barker in the Solo event, and Cheffins winning the Sidecar from Keith Riley. 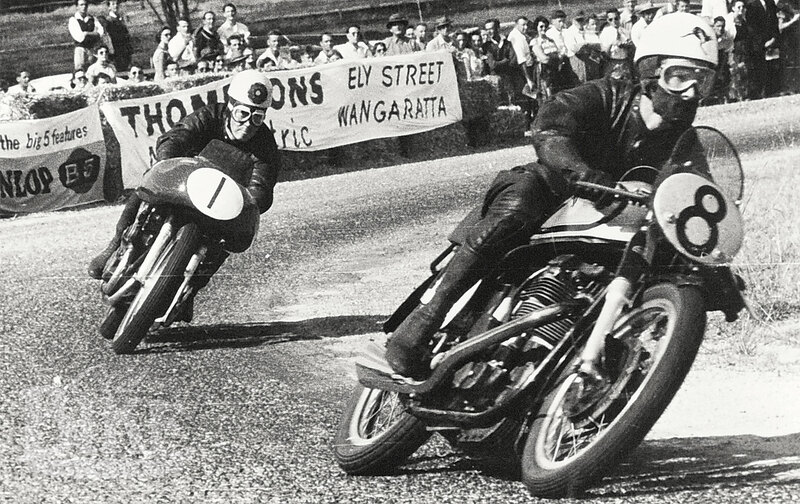 Bandiana’s swan-song as a road racing venue came on 24th February, 1957, when the title of Australian Grand Prix was bestowed on the event. Even without the lure of international riders, the biggest crowd ever seen at Bandiana poured in to watch a class entry. Once again, Keith Campbell was sidelined after injuring his shoulder at Phillip Island, and Quincey was a late scratching with machine bothers. The meeting itself was run under a gloomy atmosphere after Jack Godfrey, the popular 24-year-old from Sydney, was killed in practice. Godfrey had been dicing with Ken Rumble but lost control on the sweeping corner entering the back straight. Returning from a successful European season, Jack Forrest was at the peak of his form and armed with his potent BMW Rennsport and a 250 NSU. On the smaller machine he convincingly won the 250 GP from Kel Carruthers’ special 250 Norton and Bruce Hailey’s Velo. 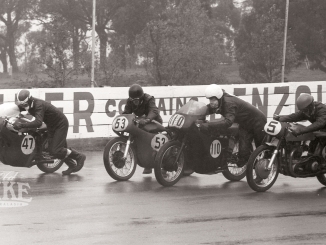 The Junior GP was a thriller, with the Hinton brothers, Jack Ahearn, Ken Rumble and Ron Miles closely locked in a battle for the lead. As Ahearn gradually drew away, Harry Hinton Junior and Rumble staged a great battle for second, with a fast-finishing Roger Barker fourth. The premier Senior GP was an even closer contest. Throughout the entire 12 laps, four riders – Forrest, Ahearn and the Hintons – disputed the lead, with Geoff Duke’s lap record smashed three times, twice by Eric Hinton and once by Forrest. After a bad start, local favourite Doug Fugger on his Rennsport BMW tore through the field to join the leading group, but fifth was as far as he got while Forrest took the win by inches from Eric Hinton and Jack Ahearn. Eric had his revenge by winning the Unlimited GP from Fugger and Triumph-mounted Frank Spiller, while Bob Mitchell cakewalked both sidecar events. The Clubmans races went to George Huse (BSA – Junior) and Geoff Curley (Triumph – Senior) and the Ultra Lightweight to Roger Barker’s MV Agusta. And so the curtain came down on racing at Bandiana Camp. In its four-year history, the circuit has seen some sensational racing and attracted the biggest stars ever to visit the country in the post-war era, but Godfrey’s death created much negative publicity, and the authorities decided they could do without that. Trevor Pound rounds the second last corner in 1956, and, in colour, the same spot today. Reaching the former circuit is simple. From the centre of Wodogna, take Thomas Mitchell Drive, which becomes the Murray Valley Highway. The entrance to the grounds is on the right about five minutes down the road. The roads that comprised the Bandiana lap are still entirely in place, although in today’s heightened security environment, not entirely accessible to the public. However Old Bike was permitted a guided tour by the Manager of the Bandiana Army Museum, Major Graham Docksey, OAM. The museum is located on site as is the largest and most diversified collection of military artefacts, memorabilia and vehicles in Australia – well worth a look. With Major Docksey’s considerable influence, we were able to navigate our way around the original course. Leaving what was the original start/finish area, the road runs slightly downhill before bending right into what is now a restricted area – the old tank training ground. This corner, and the following left, were ‘flat’ and would have made exciting viewing. Next follows a short straight which ends in a tight, almost hairpin left hander. The track now runs slightly uphill for a good half a mile before a very fast left leading onto the back straight, which is parallel with the starting straight. In the middle of this section is the cross road at the highest point of the circuit, the hump of which sent machines soaring, although the roads have since been realigned and are no longer straight through. The back straight continues downhill until it’s time to anchor up for a 90-degree left hander, which runs sharply downhill with a golf course on the right hand side. At the bottom of the hill, another square left is followed 50 metres later by a similar right, winding down past one of the original workshop buildings. Then it’s left again for another 50 metres (this section now fenced off), left and uphill to the right hander that brings you back onto the start/finish straight. With so many slow corners towards the end of the lap, it makes you realise that there was some mighty quick stuff to add up to the ultimate lap record of over 82 mph. Heading into the hairpin in the tank training area, Ken Rumble (Walsh Bantam) and Bert Flood (Triumph); and right – as it looks today.